Limited edition, all analog reissue pressed on 180-gram audiophile-grade vinyl. 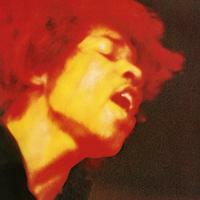 Electric Ladyland is widely considered The Jimi Hendrix Experience's crowning achievement that focuses attention on Hendrix's abilities as singer, songwriter, guitarist and producer. This multi-platinum selling collection provides the earliest insight into Hendrix's "Sky Church" concept with featured guest appearances by Steve Winwood, Jack Casady, Al Kooper, Chris Wood and Buddy Miles. Features 16 of the most enduring Hendrix classics including "Voodoo Child (Slight Return)," "Crosstown Traffic," "Gypsy Eyes" and "All Along The Watchtower." This reissue, pressed on 180-gram heavyweight vinyl at Quality Record Pressings, features a full-color booklet packed full of rare photos, liner notes, detailed session information and behind-the-scenes information about the creation of one of the most significant albums of all time. Note: The first 5,000 copies of this release were individually numbered -- our current stock is not numbered. Customer Reviews (5.00 Stars) 9 person(s) rated this product. Although very slightly different in a couple of places in the remastering (you'd have to had to worn out 12 copies like me to notice), this value-driven double LP will absolutely destroy any digital version out there...and many previous vinyl re-releases as well. I own the SHM-CD Japanese edition; anybody wanna buy it? This pretty much succeedes in bringing the recorded Hendrix into the 21st century. He was, of course, light-years ahead of everybody musically; now everyone can finally hear the sonic proof. Absolutely essential. The sound on this classic recording is what vinyl is all about. I understand why young folks that have only heard this on CD arent thrilled about Hendrix. I don't have the original LP releases, so I can't comment on a comparison... but I found this to be a very enjoyable listening experience. Large sound stage... fairly well balanced... and much better sounding than the CD remaster that I own.